The Nordic panel at the Arctic forum. 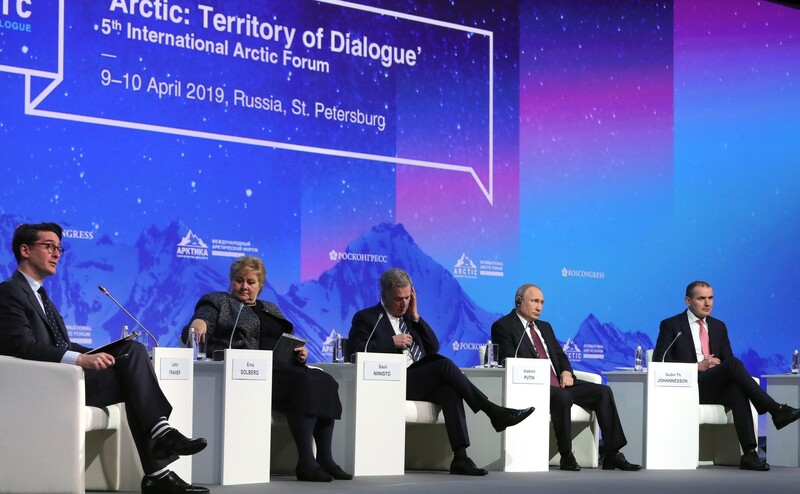 The fifth Russia-sponsored international forum “The Arctic – Territory of Dialogue” was staged last week in St. Petersburg, and President Vladimir Putin used the occasion to demonstrate his particular interest to the Arctic matters. He was joined on the panel by prime ministers of four North European states – Finland, Iceland, Norway, and Sweden – who sought to ensure collectively that the tensions in the High North would remain manageable. Putin has few concerns about such global issues as the melting of Arctic ice or the pollution caused by the black sooth, which is prioritized by Finland in its rotating chairmanship in the Arctic Council. What Putin is really interested in is using the forthcoming in 2021-2022 Russian leadership in this institution for reinforcing Russia’s coveted status as the “Great Arctic Power”. Economic cooperation could have been the most natural topic for discussions at the forum, but prospective ties are effectively curtailed by the sanctions, which target specifically joint projects in the Arctic. The plain point made by Finnish prime minister that sanctions would remain in place as long as Russia’s aggression against Ukraine continues irked Putin, who declared that Crimea had nothing to do with the Arctic and that Europe suffered twice as heavy losses from sanction as Russia did. The accuracy of such wishful calculations cannot be verified and certainly wasn’t increased with Putin’s estimate of Russia’s investment in import substitution, which left Minister of Economic Development Maxim Oreshkin rather flabbergasted. Putin followed-up by denying the spectacular growth of shale oil and gas production in the US and claimed that in some states where these resources were developed, households got black sooth instead of water from tap. Such ridiculous assertions invite questions about the sources of information available for the Russian leader, who tries to convince foreign customers that the Northern Sea Route is open for commercial transit. Maritime traffic along this hard-to-navigate waterway has indeed significantly increased as Novatek started shipping LNG from the Yamal peninsular, mostly for the Chinese market. Western investors, however, remain wary about exposure to political pressure and corruption in Russian energy business, profitable as it may be, and Shell opted last week to pull of the Baltic LNG project with Gazprom. As for the transit traffic in the Northern seas, it is not boosted by new rules and regulations introduced by Moscow every year. The chain of modernized military bases from Chukotka to the Frans-Josef Land is supposed to ensure capacity to enforce these rules, even if China is not exactly thrilled about this militarization of the Arctic. What worries Russian top brass the most is the expressed intention of the US Navy to exercise combat ships in the Northern seas in order to re-establish the norm of the freedom of navigation. Demonstrating readiness to counter this challenge is a task of greater priority than cultivating cooperation with the Arctic neighbors. Indeed, as Putin was trying to lure Western investors with new tax cuts for joint projects in the Arctic, the Northern Fleet was conducting exercises off the coast of Norway. The exercises involved missile launches from the nuclear cruiser Petr Veliky and were much larger in scale than those aimed at disrupting NATO’s Trident Juncture exercises last autumn. Mainstream Russian media is usually keen to advertise Russia’s military might; last week, however, it didn’t publish a word or utter a sound-bite about the Northern Fleet exercises. One important addition to the combat order of the Northern Fleet last year was the icebreaker Ilya Muromets, so that this summer its landing ships will be able to visit the distant bases without requesting support from the civilian icebreaker fleet. Russia’s main strength in the northern seas is, however, the nuclear submarines, and this year several new ships are due to be commissioned, including the fourth Borei-class strategic submarine Knyaz Vladimir. Putin has boasted about the newly-designed nuclear-propelled unmanned underwater vehicle Poseidon, which will be carried by the Belgorod submarine, due to be launched this year after 17 years of construction. Another of his pet-projects is the hyper-sonic anti-ship missile Zircon, which was successfully tested from land-based launchers and this year is scheduled to be launched from the new Yasen-class Kazan nuclear submarine. This massive submarine-building program demands sustained priority funding, and one inevitable consequence is curtailing of budget allocations for social programs, which is particularly painful in the impoverished regions of the High North. The accumulating discontent manifests itself in unexpected outbursts, like the angry protests in Arkhangelsk against the dumping of garbage from the Moscow region. Corruption in the military-industrial complex may be a top state secret, but it contributes directly to the extreme social inequality, so that the upper 3 per cent of Russia’s population control 89 per cent of all financial assets. The Arctic still occupies a special place in Russia’s national identity, but the proposition for asserting Russia’s sovereignty over the Arctic seas by building up the military might doesn’t command public support, and only 41 per cent of Russians are now prepared to vote again for Putin, the lowest indicator for many years. New submarines and missiles probably produce a feel-good geopolitical perspective for the Kremlin, but this military position of power doesn’t pay any political dividends because the Nordic neighbors refuse to be intimidated. This build-up doesn’t make much strategic sense either, because Russia’s security is not threatened from the High North, while it is quite vulnerable to threats in other theaters, particularly the Far East. Putin’s two-track Arctic policy has become self-defeating as resolute militarization undercuts prospects for developing international cooperation – but yields diminishing returns in terms of capacity for projecting power. He may still cherish some feelings about the Arctic, but he hasn’t travel anywhere near it for the last couple of years and hardly has a clue about the deterioration of living conditions for the majority of local population. Brandishing wonder-missiles is a poor substitute for sober downsizing of unsustainable ambitions. A version of this article is published in Eurasia Daily Monitor.